CTriSoft International: ExpDesign Studio: Powerful. User-friendly. Affordable. ExpDesign StudioTM is an integrated environment for designing experiments or clinical trials. 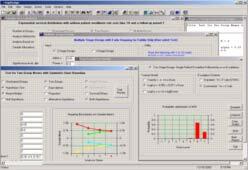 It is a powerful and user-friendly statistical software product that has integrated 8 main components: Classical Design, Sequential Design, Multi-Stage Design, Dose-Escalation Design, Adaptive Design, Adaptive Trial Monitoring, Dose-Escalation Trial Monitoring modules, and ExpDesign Randomizor. In addition, ExpDesign Toolkit provides features for distributional calculation, confidence intervals, function and data plotting. In addition, Enterprise Version 6 can generate SAS code automatically for adaptive design simulations. Copyright © 2002 - 2015 CTriSoft International. All rights reserved.